Last year I was in Pottery Barn and saw a wine barrel lazy susan that I liked. What I didn’t like was the $129 price tag! Here is my inspiration for this project. I put the project in the back of my mind until recently when I found a lazy susan in a junk shop. I paid my $1.00 and headed home with this beauty. Well, I hoped she would turn into a beauty with a little pampering. The piece was stained an ugly orange color so the first thing I did was lightly sand it. I wanted the look of planks of wood so I took a pen and ruler and drew lines in the wood. The wood was soft enough that by pressing hard the pen made a groove. I then applied a coat of stain and wiped off gently leaving more color in certain areas . This was a big improvement on it’s own. The more I looked at the PB version I felt the design was a little plain for me. I found an image I liked at The Graphics Fairy and made a copy enlarging it to the size I wanted. I already had all the materials I used left over from other projects. PB you know I love ya…but I like my version better and it cost $128 less than yours. Don’t feel bad because you’ll end up with some of the money I saved. I just ordered two lanterns from you. Of course I am known for being rather thrifty so I waited until they were 75% off. Thanks for the inspiration Pottery Barn! Way cool! Your project turned great! In fact, I like yours better than the PB version. Theirs was definitley a bit plain. Yours has so much more character! I will now be on the lookout for lazy susans in my junkin' travels! Wow, that is an awesome transformation! You certainly can't beat the price! Well done! Wow! impressive…a dollar well spent! So creative! Was that enough explanation marks??? Gorgeous! You are a genius! Only trouble is…now I want one;)! Wow that lazy susan turned out awesome! I love it! Fantastic! This looks fantastic! My girlfriend and I were looking at some of these at Tuesday Morning over the holidays that were made out of several barrel boards cut to the shape of a circle. She wanted one but we did not like the way the boards might bevel making the center unlevel as one solid piece would not. I have a lazy susan and advised here against that one with the boards as well. What we were both ogling over was that it was stamped like these. I told her we could paint something on one and it would be better but I hadn't thought of The Graphics Fairy at the time. That is a fantastic idea. I will pass it on and I am sure she will be thrilled! Now if we can just find her one at a great deal like you did. haha! Thank you! Way to go Sherry! My heart went a flutter when I saw $1.00 I so love a bargain. And might I say the grooves are the tiny detail that really make it sing. The lazy susan came out amazing! I love it…I just gave one away~darn it. I agree with all of the folks above. It is gorgeous! This is a fabulous project! I love it!! I have a lazy susan in my studio and I am definitely copying your idea. Thanks for posting this. I have to say, Sherry, that yours looks SO MUCH better than the PB version! I can't believe they want $129.00 for theirs! Love the technique you used to get the imprint on the lazy susan. Wow!!! and yours looks way better! I love this! You did a fantastic job. Tnhat is some knock off and what an awesome price. I think your first project of the year is a homerun hit right out of the ball park. You are very creative! And if Pottery Barn can sell their's for $129,,,,I'm thinking you could sell your's for $150 or more! I guess I just never thought of using other things for inspiration and then looking for what I would need to "copy" the idea. Such a simple thing but the thought never crossed my mind. Thank-you. YOU are my inspiration! I already hang out at the thrift shops so I am looking forward to creating. 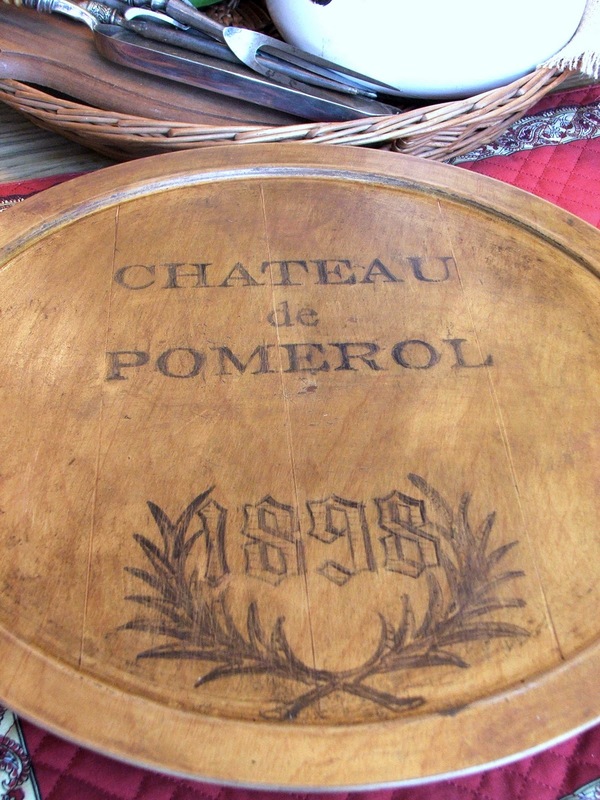 I have a lazy susan that I might try my hand at making one of these…love it! Sherry, you are GOOD really really GOOD! I don' even know how to download graphics and print out stuff! I need to learn. I love how you made that look old with the lines and the writing on it is perfect. Yes, it is way better than PB's overpriced version. Thanks so much for sharing this at my party! Sherry, you knocked this one out of the park girl! It is better than the PB one to me! Sherry, you are amazing! I think your's is even better!! I want to try this myself, great job! Definitely like yours better than PB's! You did an amazing job and I think you will enjoy it all the more knowing how much $$ you saved. What a gorgeous lazy Susan! I'm kicking myself now for throwing out an old one we had. You did a fantastic job for an amazing price. Take that PB! A terrific find at a great price! Thanks for sharing this fun project. Well I bet there will be a run on old lazy susans at all the thrift shops today. Great project Sherry and your graphics are perfect. Thanks for adding another craft to my list of things I've got to try. It turned out SO FABULOUS Sherry – great idea!!! Brilliant! You must be loving that lazy Susan (and the price). That turned out wonderful!! 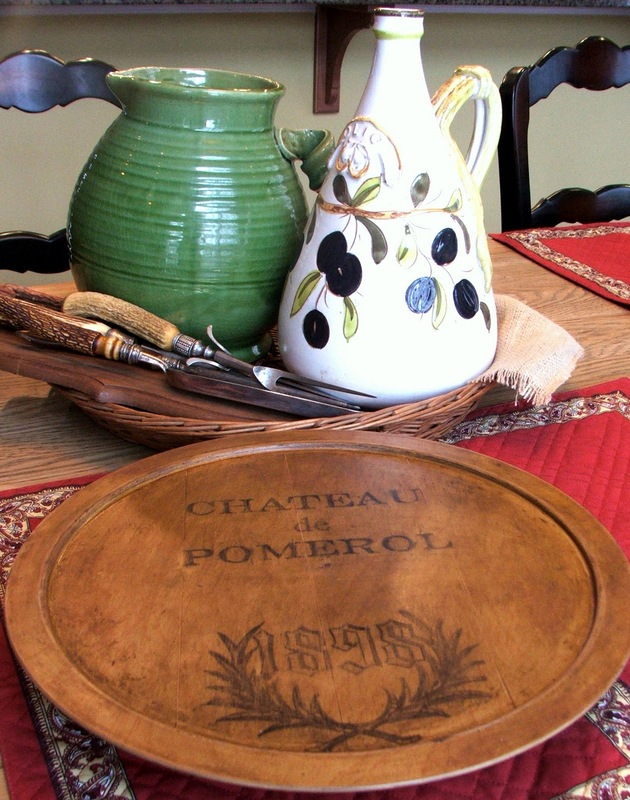 I have a really one from a winery in France, that I bought a few years ago at a local gourmet kitchen store. Yours looks just as good and boy or boy – yours is almost FREE! Great job! Well, yours has Pottery Barns beat to pieces. It's much, much nicer! I'd pick it first any day. I have two or three of these lazy susans…now I know exactly what to do with them. Fantastic idea Sherry! I just love this!! What a great way to recreate something at a fraction of the price!! Awesome! I love this project so much! I wonder if I'd get lucky enough to find a lazy susan for $1 to try it out!! Thanks for sharing! Love love love that idea!! It is gorgeous! OMG that looks awesome! I have to agree with you, yours looks better than PB. Thanks for sharing the how to and for your inspiration. Wow! What a difference a day makes! It looks so authentically better than PB! Get out!!!! YOurs is waaaaay better!!! You just saved a ton of money…love the look of yours! I have nothing else to say except "fab-u-lous!" Love that this was a thrifted item! Thanks for linking up at WWC! This is amazing, I can't believe how well this turned out I think this looks better than the one from PB. Gotta love a bargain. This is absolutely amazing, I just love what you did. I do believe I like yours better, and the price is no comparison. Great job Sherry. Sherry, I absolutely love this! I absolutely agree, your version is much better than PB, and cheaper. What a great project. Wow – that looks amazing! I LOVE the details you put into it with the staining and creating the look of wood planks. Brilliant! How great to find such a deal on something and turning it into something wonderful. Nice work! What an amazing project! It turned out wonderfully! Your transformation came out PERFECTLY. Fun blog theme! Fantastic!! I am so impressed, I love this idea. Great job!!!!! I love this. You are just too good.! I don't see you for a while… just thought of dropping by to say "hello". How absolutely terrific! Yours is much better thant the PB version. All over blogland, women have just written this down on their list of things to find and do. It's certainly on my list! You are so-o-o- smart! I like yours so much more than the PB one! Does the paint pen come from a craft store or is it a specialty item? Okay..gotta leave a comment. Brilliant!!!! Between the photography and gluten-free blogs I don't get to many of the decor blogs, but yours is in my favorites. This is an example of why Awesome! In the words of my little girl, "BooYa!!!!!WONDERFUL!!!!!!! Thanks for joining Get Your Craft on Thursday! Bazinga! I absolutely love it! I see those all the time at the thrift stores and could only invision yucky decoupage on them. I like your version better too!! What a great project! What a beauty! Great Job – this is why I just love your blog! I love this project! I have had a Lazy Susan for over a year that I picked up at Goodwill and didn't quite know what to do with it. Now I know! Thanks for sharing yours. It looks great! Yours is even better! Thanks for all the inspiration we get from PB in blogland. Sherry, I just love this lazy susan! I will be searching for an old lazy suzan to do this too! Hoping I find a lazy susan for a buck somewhere so I can do this too! Amazing job! Sherry I know I have already been bby to admire and drool over your lazy susan but I wanted to let ya know I am now trying to figure out how to do something similar to our plain cutting board. Let ya know if I figure something out. Thanx again for a great inspiration project! I don't know how I missed this lazy Susan post, but I did. I love it!! And for $1.00? You are a very creative and talented lady. And if you live close enough, I would cook for you as often as you would drop by. Love it! Makes me want one! Can't wait for garage sale season! Sherry, I've too admired these pieces. Have to say yours is better looking. You are very talented and one clever individual. Great project! Fantastic idea. It looks great. I'm off to check out your antiquities sign! Looks great! I can't believe the PB one was that much. Geez! Hope you'll come see the picture wall I helped DD2 create for her home. Holy moly!!!! That IS amazing!!! So cute, now I want one!!! You blew PB's right off the map! It looks great! 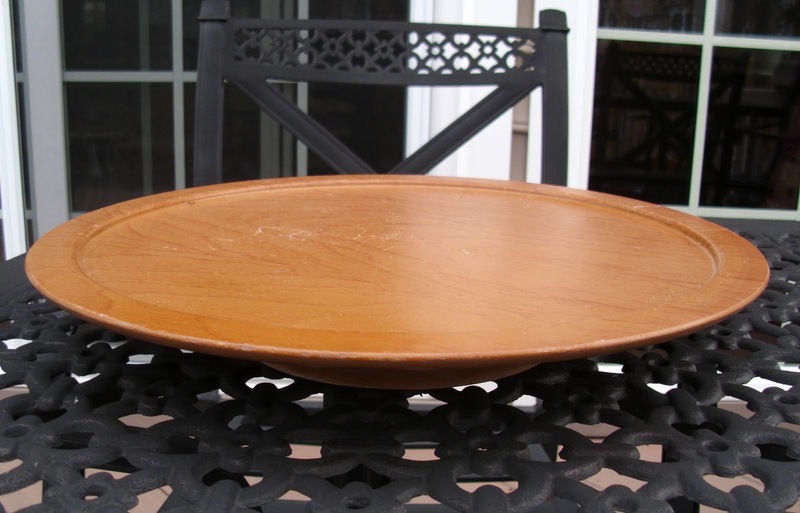 I have an old wood lazy susan at our cottage! I am going to try it. If I do I will credit you with the inspiration! I am a PB Outlet shopper. Even there I wait for the sales! Most of their stuff is so overpriced. You look on their outlet web site and it 75% less for the same thing in the outlet. Crazy! This is a big Wow factor, you took a boring lazy susan and made it spectacular….. it is so much better than the other one without a doubt. Now look at what you did- it seems like everybody wants one now…. Thanks to YOU! Again, how did I miss this when you first posted it? ?…Yours btw is so much nicer than the PB one and the price tag, forget about it…Great job once again. 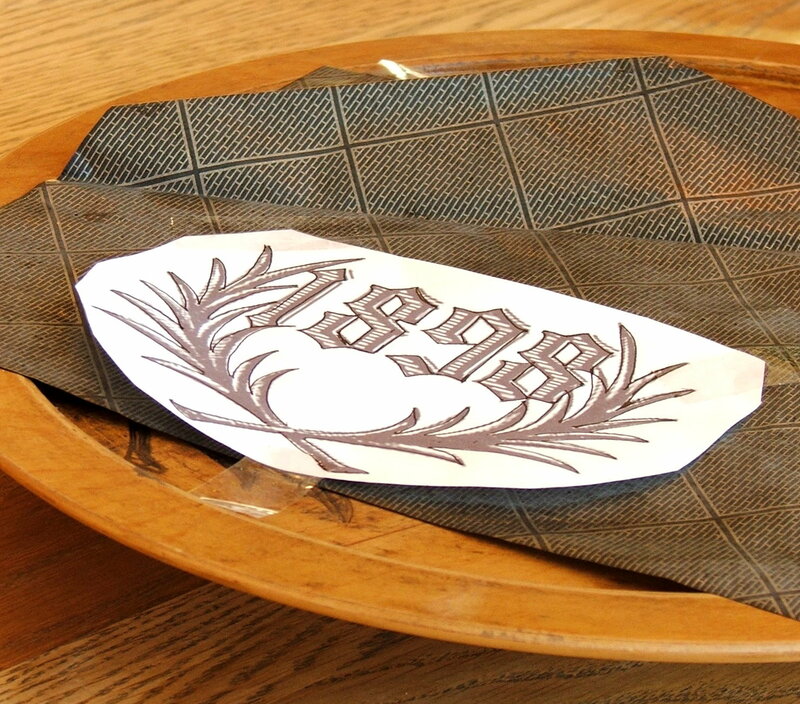 I just love this… I want to copy your design… having much trouble finding the date and leaves on graphic fairy… do you remember what it is called? Olá Sherry!!! Seu blog é maravilhoso,um charme, muito inspirador e seus trabalhos são lindos… Parabéns!!! É um prazer visita-la, realmente tudo muito encantador. Love, love, love this! Today I found a lazy susan just like this, only mine was $2, still a bargain. I love how yours turned out, mind if I steal? Love this! Looks great. What colors did you use and how was it painted? Love this! Woud you mind sharing waht color you used and the technique to paint the lazy suzan? I think yours looks 100 times better than Pottery Barn's!